Please note that all text and graphics contained on these pages are the property of Emma's Treasures. and may not be copied or reproduced in any way what so ever. Nor may Emma's Treasures be held responsible for any errors or omissions. 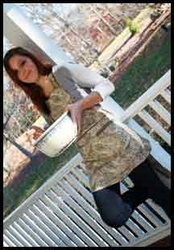 Our sewing patterns offer the sewer a way to express their creativity in a very special way. 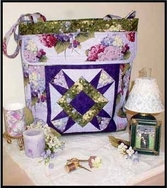 By changing the fabrics to your own you can create a beautiful bag. Each pattern in our line is an original design by Debbie Quinn. The easy to follow directions include a written direction as well as an illustration defining each step as you sew. Many patterns also include fabric layouts, a cutting chart as well as cut apart labels to be pinned to cut fabric pieces for easy reference. Every bag pattern is beautifully lined for professional results. Also check out the notions page. We now have low profile snaps, d-rings, interfacings and fusible fleece by Pellon. This lovely tissue holder is perfect for a lovely give and it is free with the purchase of any retail pattern order. 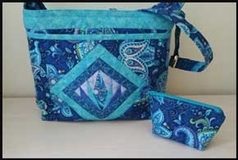 "The Carry All Bag Pattern"
The carry all bag with its foundation pieced front will look beautiful done in any coordinating fabrics of your choice. the bag features a front foundation pocket, a large back pocket with a snapped cell phone pocket as well as a secured zippered top. Inside you will find two welt pockets (one for credit cards), a divided pocket and a coupon pocket. this bag also has room to hold a 10" e-reader or other device. 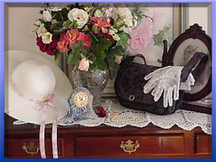 The Little coin purse, or cosmetic bag can be found under the Septembers newsletter and is a free download. Patterns include many nice features such as fully lined interiors , zipped or magnetic snap closures, as well as beautiful foundation pieced fronts. All patterns are designed with the sewer in mind and include lots of pockets for your accessories. All the sewing patterns are designed for the artist in you.